Which diseases will stalk the Hackney Empire next spring? It’s a question we’ve been thinking about since Song of Contagion began. We’ve made a lot of progress to date, with help from many of you. That’s helped refine our thinking, and we’ve a better idea of how the show might work than we did at the start. So we want to ask for a final round of disease input before handing over to the music creatives. We hope to end up with a shortlist that the songwriters and composers can use to start creating the show. If you’ve got ideas, please join Elizabeth for beer, pizza (or other forms of booze and sustenance, depending on how many of you email and say you’re coming) and discussion at her place in north-east London on the evening of Monday July 11th. I’m lobbying for a diarrhoea story (Drain Brain?) that starts in 1830 and tells the story of poo-related deaths in London and Calcutta. The British and the Indian music will start off at the same volume because back then, diarrhoea was killing roughly the same proportion of the population in those cities. Then in the 1850s the British music gets deafening — that was the Big Stink and the cholera epidemic that followed. This rattles the Victorians into action, and they start to build drains — represented by the introduction of a didgeridoo as a bass-line to the British music (I’m hoping for a dij because it both looks and sounds like a drain…) As a result, diarrhoea deaths in London plummet. While the dij bass-line carries on, the rest of the British music gets quieter and falls silent. The Indian music, on the other hand, never gets a bass-line. Neither the colonial government nor the many subsequent Indian governments have invested sufficiently in basic sanitation, and tens of thousands of children continue to doe of diarrhoea in Indian cities to this day. Parameters illustrated: Prevalence, near/far, infrastructure, time. Dengue Merengue (HT Andrew W). Contrasting dengue with zika. Both are viruses spread by the same mosquito, in the same places. Dengue has been quietly killing people for years, and gets virtually no attention. 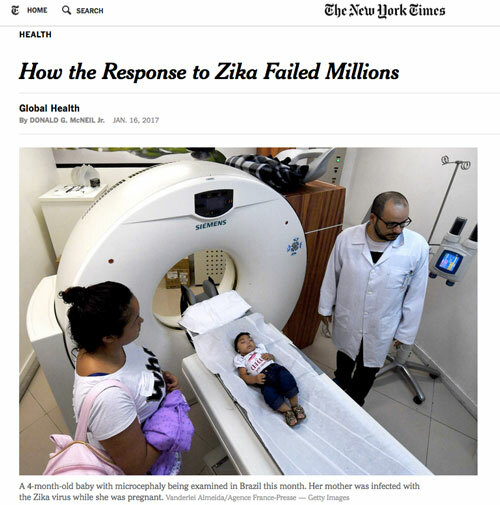 Along comes zika, throwing up pin-head babies at a faster rate than the Brazilians can build Olympic stadiums. Front page news! Parameters illustrated: visible vs. shocking, cute victims, near/far, press as influencers. Shell Shocked: the story of mental illness resulting from war and violence. A century ago this was a “pull-your-socks-up” condition. Eventually it became diagnosable (as post-traumatic stress disorder), then pathologised and treated, though arguable only if you are lucky enough to experience it as a soldier from a rich country with a big health-care budget for veterans. The vast majority of civilians in conflict zones are exposed to more shocking violence and loss than intervening troops, but get no care. 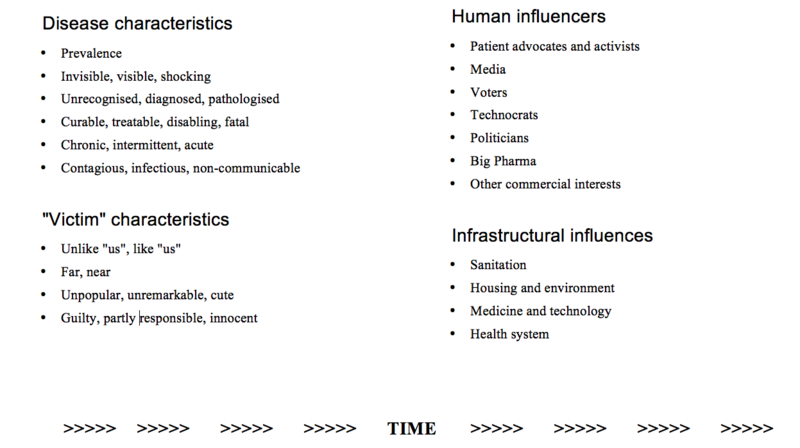 Parameters illustrated: Unrecognised to pahtologised, near/far, us/them, Pharma as influencers. We’ve got a couple more up our sleeves, but you get the picture. We want to hear YOUR suggestions. Please contact Elizabeth with ideas, or if you’re in London, come along at 7.30 on July 11th. If you e-mail info@songofcontagion.com, we’ll send you directions.